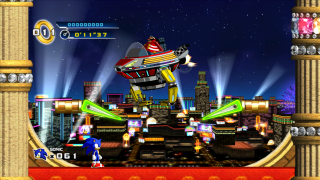 The Casino Street Zone Boss is an inspired recreation of Sonic the Hedgehog 2's Casino Night boss, with Eggman using a claw machine in a pinball arena. Eggman uses a different attack method than his previous encounter against Sonic. He tries to grab Sonic with the claw and drop him on a set of spikes that rises from the bottom of the arena. After a few hits, Eggman will rise further up the arena and start dropping bombs as he did in Sonic 2. Just like the original Sonic the Hedgehog 2 encounter, the claw gets an electric current flowing through the claw, which makes the claw attack far more deadly. Let him sit in place for too long, and he does a ricocheting spin move around the arena.